Deporting criminals to Central America helped cause the same violence that today’s migrants are fleeing. 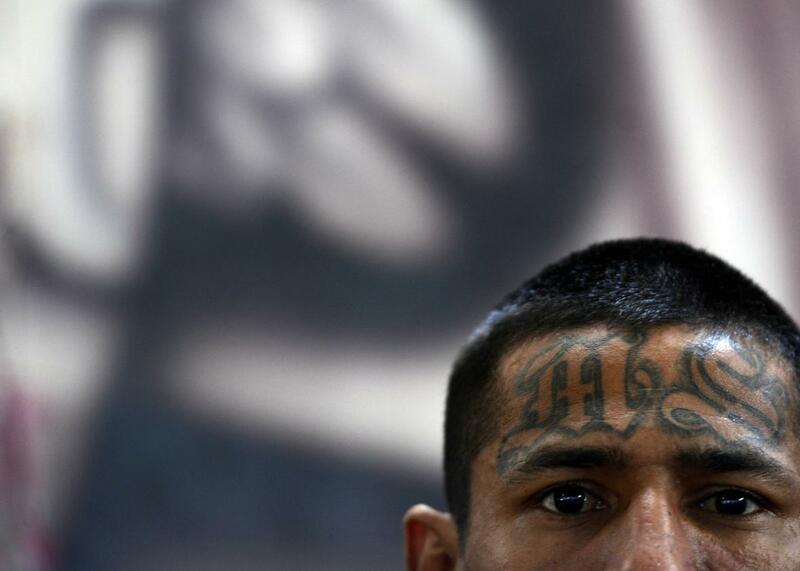 A member of the Mara Salvatrucha, or MS13, is pictured on March 4, 2013. Wednesday, in a meeting with Guatemalan President Jimmy Morales, U.S. Homeland Security chief John Kelly appeared to contradict the prevalent understanding of Donald Trump’s recent deportation directives, assuring the Guatemalans that rather than deporting people en masse, the administration would simply step up deportations of people with criminal records. Deporting undocumented people who commit crimes in the United States is the kind of policy that tends to get wide bipartisan support, even from people who are relatively sympathetic to immigration reform. The Obama administration deported such people at a record clip. But while the optics are certainly better than deporting hard-working families who are law-abiding aside from their immigration status, deporting “bad hombres,” as Trump memorably put it, is not without consequences. In fact, past rounds of this kind of deportation are in part driving much of the migration into the U.S. today. Three countries—El Salvador, Guatemala, and Honduras—received more than 90 per cent of the deportations from the United States (USAID, 2006, pp. 18–19). Many of these deportees were members of the 18th Street and Salvatrucha gangs who had arrived in the United States as toddlers but had never secured legal residency or citizenship; they had joined the gangs as a way to feel included in a receiving country that often actively impeded their integration. On being sent back to countries of origin that they barely knew, deportees reproduced the structures and behaviour patterns that had provided them with support and security in the United States. They swiftly founded local clikas, or chapters, of their gang in their communities of origin; in turn, these clikas rapidly attracted local youths and either supplanted or absorbed pandillas [local gangs]. They also create the violence that causes their law-abiding neighbors to flee. Unauthorized immigration from Central America has been steadily growing in recent years as immigration from Mexico has declined, including thousands of unaccompanied minors fleeing gang violence and poverty. The U.S. contributed and prolonged Central America’s violence during the Cold War by arming and funding anti-communist governments and rebels, including those involved in vicious human rights abuses, prompting Central Americans to flee to the United States. Then in the 1990s, the U.S. deported criminals back to these countries, while simultaneously supporting government crackdowns on gangs and drug smugglers, essentially feeding both sides of increasingly deadly conflicts and driving a new round of migration. Trump may believe that with deportations and a big beautiful wall he can cut the United States off from Central America’s problems, but he’s more likely just kicking off the next phase of the deadly cycle.